Greetings snacklings. Well, it’s been a month since I’ve last joined you here on the old website. Took a bit of a hiatus. I wish I could say it was planned, like when those supercool design firms shut down their offices for a year so the designers can go get all inspired by traveling and checking out interesting stuff. But nay, really I’ve just been in a funk. Couple that with the return of all of my favorite TV shows, and you have the perfect recipe for unproductivity. My time wasn’t all wasted in front of the TV though. I took a brief 48 hour jaunt across the gulf to visit a friend in Dallas. While there, I attended a comic book convention. It was a good time. There was a lot of good nerdy cosplay. Always key for a good convention experience. Dr. Who was very strongly represented. Which is kind of lame because I don’t really think bow ties can be counted as costumes. Oh, you have a cinnamon brown wool blend coat. That must’ve taken you forever to not make by hand at all. The pimp Jabba the Hutt I saw, that was a costume. I was able to add a few new action figures to my burgeoning Masters of the Universe collection while roaming the con floor. Roboto, Whiplash, Leech, and Stratos if you were wondering. I also bought a few packs of Saved By the Bell trading cards. Shirtless Mario Lopez in acid wash jeans: check. And I had a crazy sense memory flashback as I rummaged through a bin of loose toys and picked up a Sectaur action figure that I owned as a child. I had completely forgotten the Sectaurs existed. I was immediately whisked through time and remembered happily playing with it on the living room floor. It was awesome. The mind is an interesting device. While not nerding, I was tooling around the Dallas-Fort Worth area absorbing Texas. The big news at the time was that their massive state fair statue guy thing Big Tex had burned down. I know this because while at a taco restaurant (enjoying the best tacos I’ve ever had) they devoted the first ten minutes of the 11 o’ clock news to continuing coverage of this tragic event, complete with people leaving flowers and looking legitimately sad. This coverage was only interrupted for the latest footage from all of the local high school football games. Texas. I got to try In-N-Out Burger for the first time, which was great. And Jack in the Box which was also great in an oh-my-god-this-is-so-bad-for-me kind of way. Both of these stops occurred within about 90 minutes of each other on Sunday morning just before I headed to the airport. There was some inflight turbulence but none of it was caused by weather. If you catch my drift. Earlier in the weekend I mentioned to my Texas-based friend Erik that I wanted to find some beef jerky to take home for the blog because that seemed like a quintessentially Texasy snack. He said he had a friend whose father owned a beef jerky store. I responded with the proper level of enthusiasm (a beef jerky store?!) and we scheduled a trip. Though the store front marquee simply and gloriously read “beef jerky,” it was in actuality a purveyor of many kinds of meat and meat accessories. Texas. The cramped space was stocked with rows upon rows of rubs, spices, and marinades. All of which I would have loved to bring home to the Sunshine State and try at my leisure. But I demurred as I did not want to have my name land on the terrorist no fly list if the perma-miserable TSA agents at Dallas-Fort Worth International were to stumble across a 4 ounce bottle Great Uncle Slapjack’s Texas Style Barbecue Sauce in my carry-on. They hate us for our freedom. 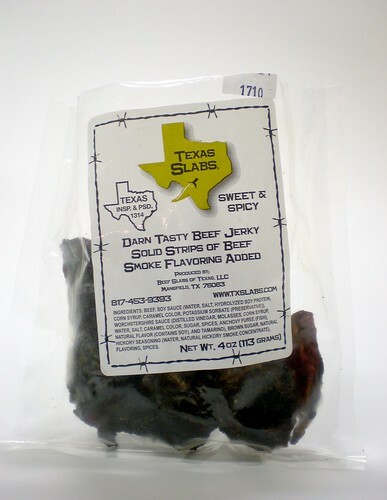 But I did pick up this bag of their homemade and safe for airline travel Sweet and Spicy Beef Jerky. Kudos on not calling it “artisan.” Keep it manly. 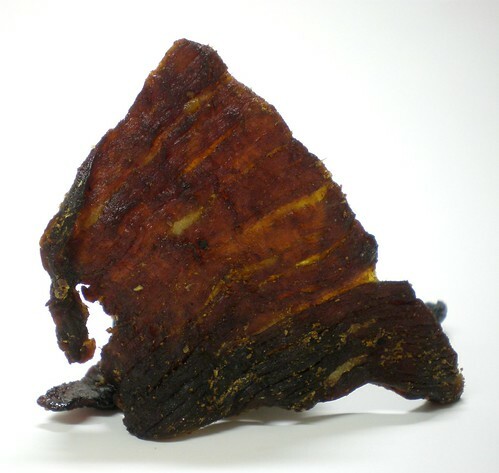 I like beef jerky. I find the act of gnawing very satisfying. But I generally don’t eat a lot of beef jerky. Mainly because my only real experience with it has been through the products of large corporations such as Jack Links and Slim Jim. And to be fair, Slim Jim is to beef jerky what soiled lawn mulch is to beef jerky. I’m happy to report that my first go round with handmade beef jerky was a success. 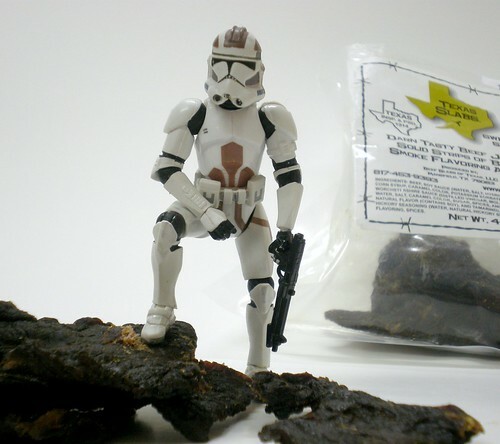 The jerky seems pretty stock standard. It is indeed both a little spicy and a little sweet. There are notes of soy sauce and Worcestershire (two of the main ingredients), and some subtle smokiness. The spice level is perfect. Nothing overwhelming (not a spice fan), but a nice general heat that coats the mouth and builds incrementally through the gnaw. The salt level is optimal as well. This is good stuff and provides a rewarding chew. Well done Texas Slabs. 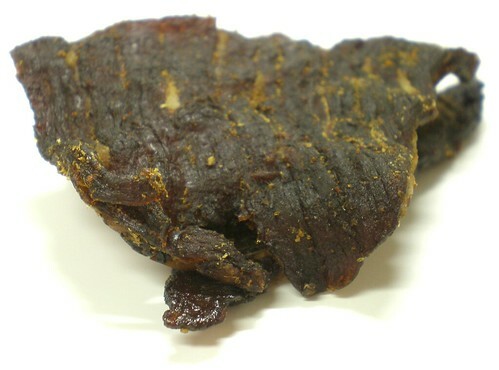 I wish we had some homemade beef jerky stores in the area. I could make this manly snack a regular habit. But sadly, all of our available retail space is currently dedicated to dolphin statues and sand dollars. And believe me, sand dollars DO NOT provide a good chew. Stupid alcohol. Florida. This post was dedicated to the memory of Big Tex. Bahahaha! I had no idea. I’m gonna have to find this place. Thanks! BTW, got something for you to try if you’re looking for new review material. Publix started carrying a product called Brownie Brittle. Holy mother of Jeebus, that stuff should be sold in pharmacies and on street corners, but it has no business being passed off as a grocery item. It’s in the deli section by the bagel chips and pitas and stuff, and I recommend you have your willpower turned up to eleven if you decide to give it a try. Looks like Texas Slabs delivers, if you can’t satisfy your jones locally. Is there any greater pool of things that will always make me snicker than names given to meat snacks? Unlikely.